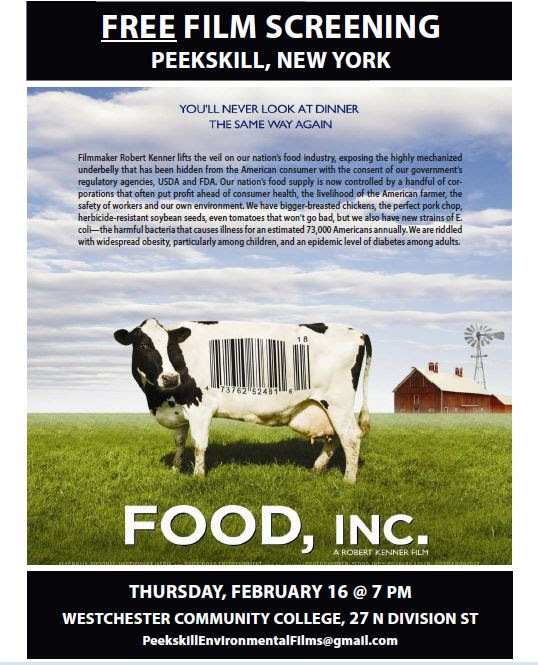 Thursday: Peekskill Environmental Film Series – Food Inc | PEEKSKILL ROCKS! The Peekskill Environmental Film Series is starting up again on the the third Thursdays of February, March and April. This month, the film is on Thursday, February 16 at 7pm at Westchester Community College, 27 Division St in Peekskill, NY. Food Inc. – You’ll never look at dinner the same way again! Movie followed by Q & A with Trish Vasta (Hemlock Hills Farm).